Rohit Sharma or Virat Kohli; Who would be a better skipper for Team India in this ICC World Cup 2019? IPL 2019: Time is the longest distance between two places and the condition which Virat Kohli is reflecting is the same. The fans are finding the alternate caption for team India in coming World Cup after seeing the failure of Kohli’s captaincy. Indeed, Virat is a great player who holds several records at the international level but in this IPL, he couldn’t mark a single win for his team Royal Challengers Bangalore (RCB) and stands at the bottom on the points table. Not just in this League, Virat couldn’t make his team win in the last 3 ODI games against Australia. This is the 6th game in his captaincy in which his team lost the game, and that makes it nine. 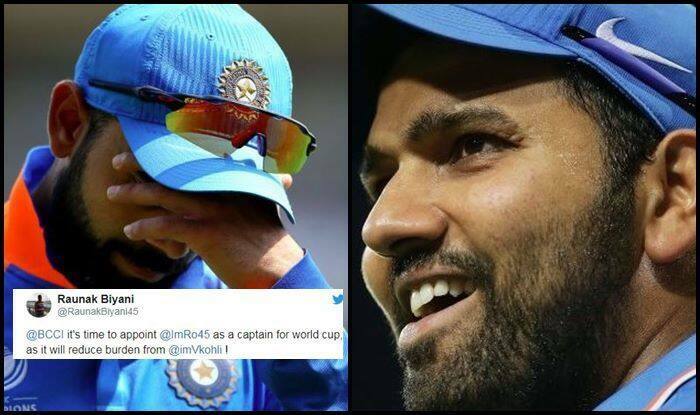 The fans are demanding Rohit Sharma as the Captian for Team India in the upcoming World Cup as the Mumbai Indian skipper has been performing well for ever since he took over the reins from Sachin Tendulkar in 2013. MI are three-time champions in the cash-rich league. Rohit had a vast experience in handling the team and thus fans want Hitman to represent team India in World Cup 2019. You must appoint @ImRo45 as a Captain for World Cup, else be prepared to loose badly under IMPOTENT captain @imVkohli..
We need Rohit sharma as our captain in World cup.. The team for the upcoming World Cup will be announced on 15th April. It would be interesting to see the final squad that will board the UK-bound flight, later this year for the marquee event.